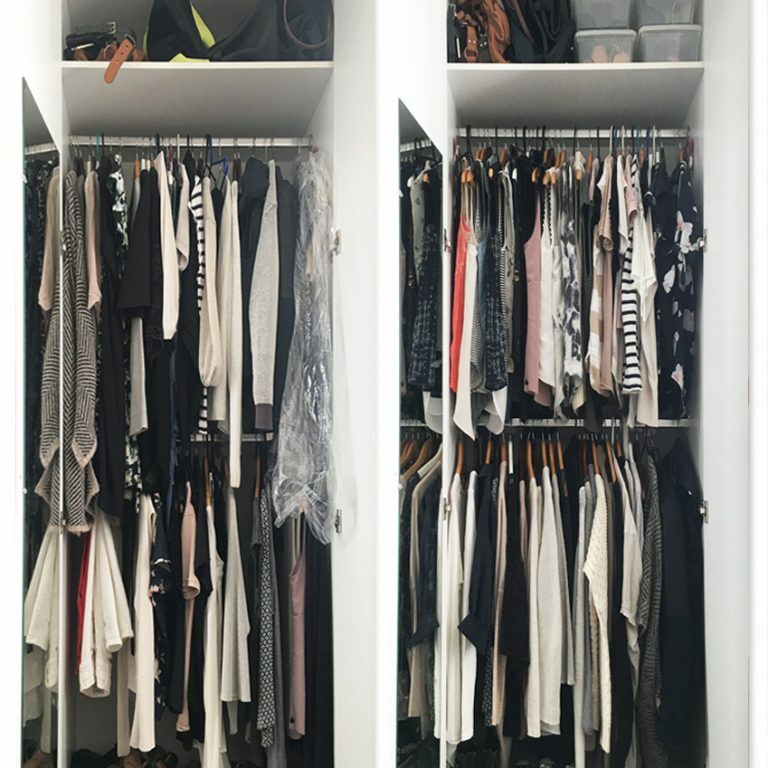 This client had 3 different storage areas for her clothes and her brief to me was to “make dressing easier! !” so she booked in for a wardrobe makeover. Therefore I went through everything, decided what needed to be hung, folded, boxed, popped in draws or thrown out. I re-organised her belongings and it turns out she had several summer patterned tops which was EXACTLY the type of garment she thought she was lacking!! She couldn’t see any of her printed tops so she had already put that on our ‘shopping list’ when this would have been a huge waste of money & time. 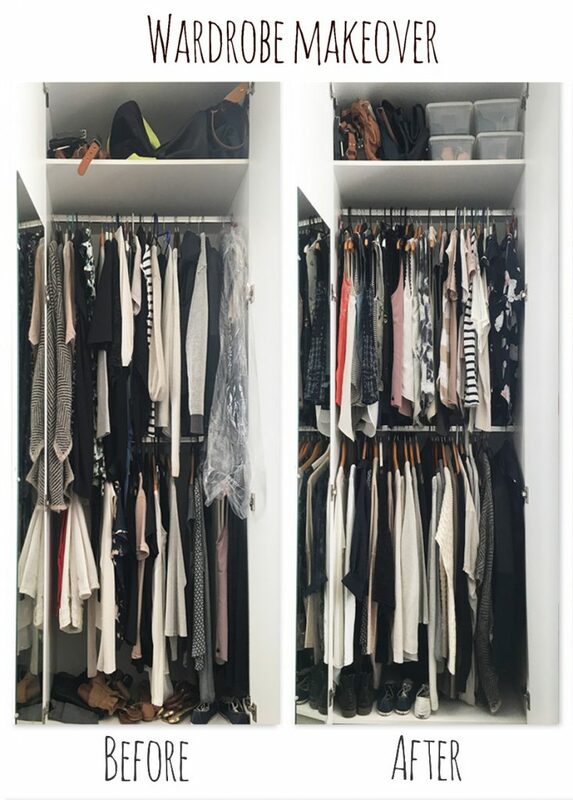 With her clothes stored in categories she can see in an instant what she has lots of and what she’s lacking and suddenly outfitting becomes a breeze! In my experience as a personal stylist, if you can’t see it, you won’t wear it!! This client benefited from my knowledge of style & fit theory. 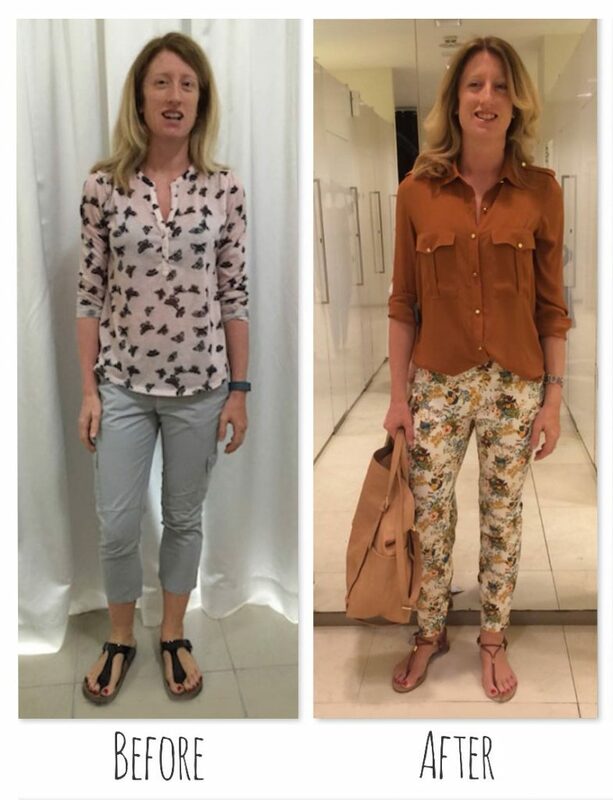 LEFT : Yvonne loves wearing chinos, yet because of the pocket placement on the pink style, they make her look heavy at her hips, which she is NOT! This effect is worsened by the top blousing over the waistband, there’s just too much fabric here to flatter her fantastic figure. The solid black colour doesn’t help either! RIGHT : You can see how the 2nd photo corrects these things. The improved fit of the entire outfit is much more flattering on her slim frame as she suits less fabric and closer fitting styles. Moving the waist upwards slightly lengthening her leg, even showing a little skin at the ankle helps retain correct proportions. I then added a belt to strengthen her look. 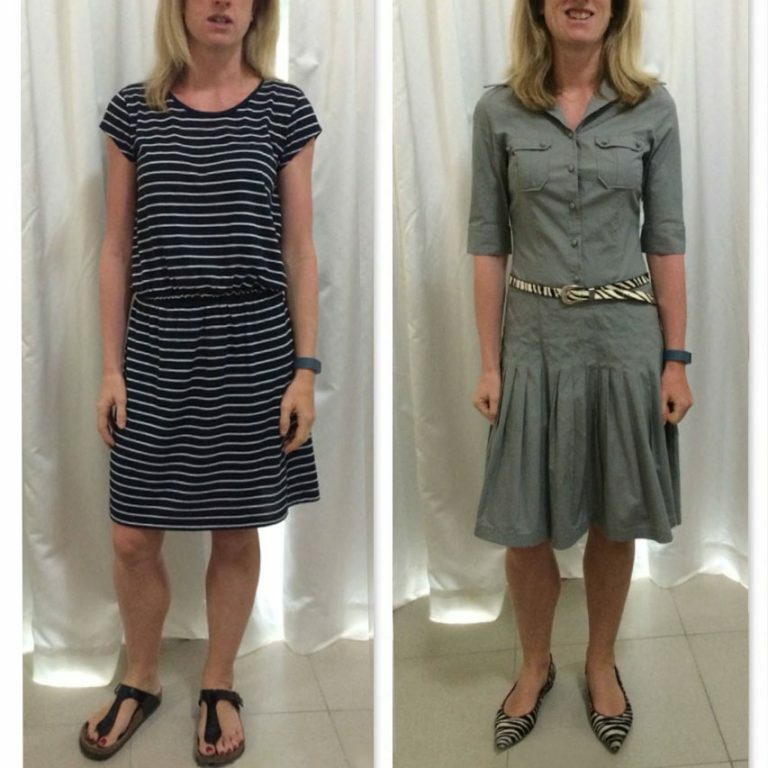 These photos illustrate the power of a fashion makeover. PHOTO 1 : LEFT. Why throw on a pant & top like this, when you can throw on the flattering outfit on the right? PHOTO 1 : RIGHT. Amanda looks stylish as well as much younger as it’s a fun, preppy look that represents her personality rather than the dated, shapeless outfit on the left that made her feel frumpy. 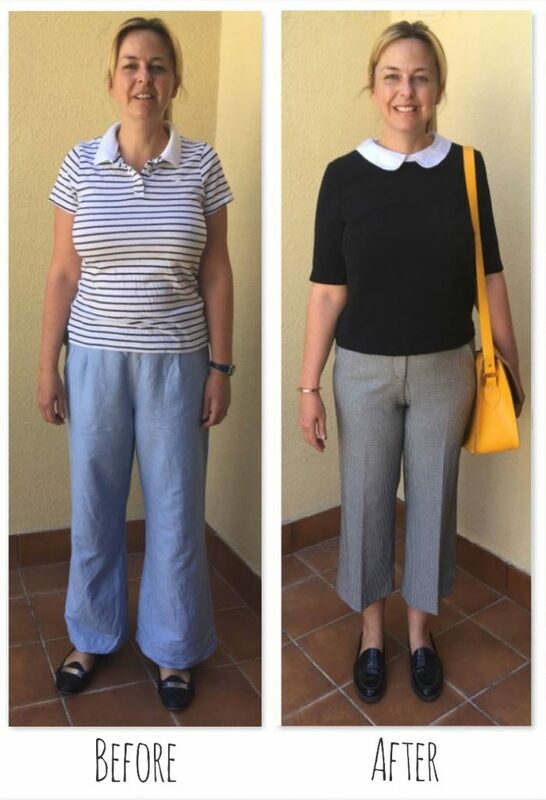 She still wears easy fit pants + stretchy top + flat shoes but i’ve given her a total fashion makeover! PHOTO 2 : LEFT. 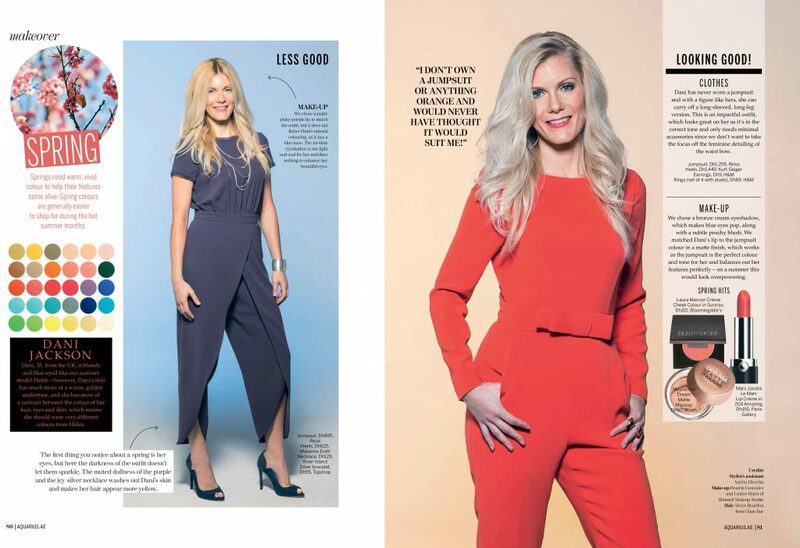 These 2 dress styles are both fantastic on Amanda and all women need both these shapes of dress in their wardrobe. This easy-fit day dress is elevated due to the silky fabric, flattering shade and stylish accessories. PHOTO 2 : RIGHT. The blue figure hugging shape is a bold choice for a special event and I think you’ll agree she looks a knock out! 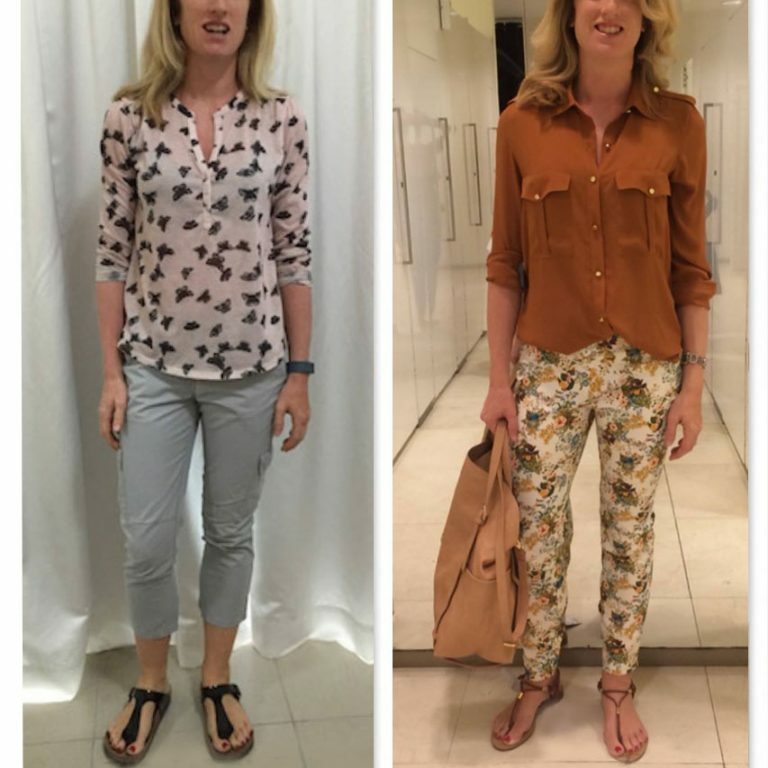 This is one of my own outfits showing a garment makeover to illustrate how vital tailoring is for certain clothes. If you’ve read some of my body type content then you’ll know that there’s many types of shapes which alters how to dress for your body shape and there’s very rarely a ‘one size fits all’ approach. If you’ve also read my industry insider content, then you’ll know there’s no sizing standards in Australia for adults (!!) which means that clothes sizing can alter dramatically between brands. Both these reasons, plus the fact that some styles are just badly designed or manufactured, or a change in fashion trends, means that tailoring the odd garment is necessary. This is money well spent!! When you think of how good all the actors & actresses on tv look, it’s because they have a large wardrobe department altering all their clothes styles to fit each body type perfectly. I’m not suggesting to tailor everything , just the pieces that are almost there but not quite as flattering as they could be. 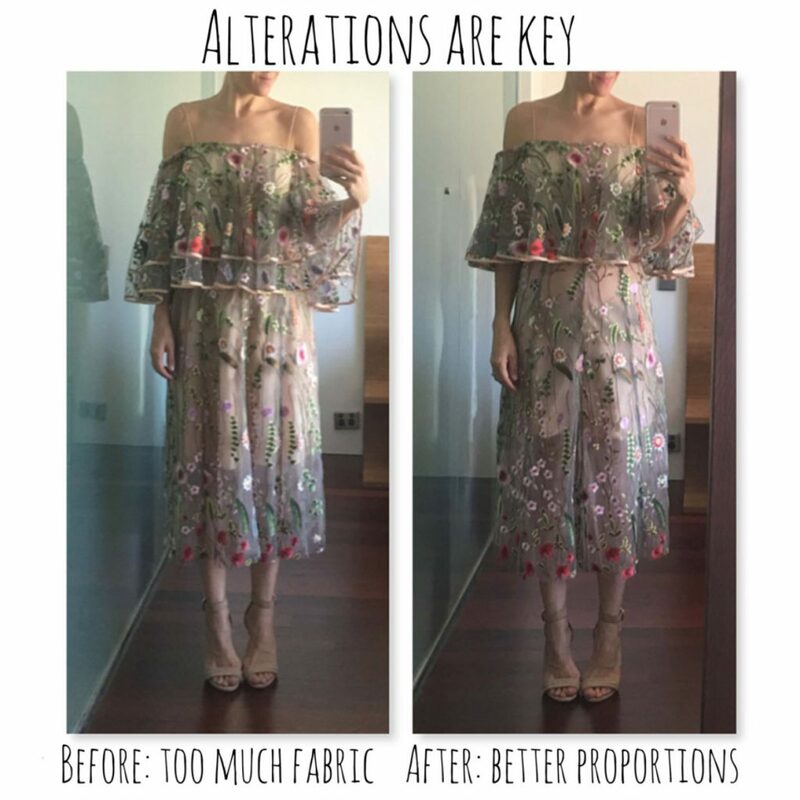 Invest in making it perfect and it will become the back bone of your closet. 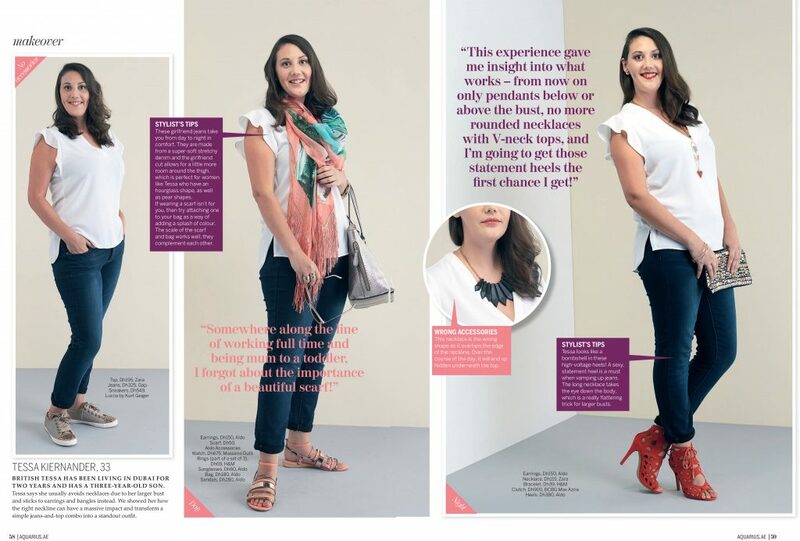 Like many new mums, Nesli needed a mummy makeover as she now demanded practicality combined with style and that’s exactly what I gave her, a versatile, comfortable maxi dress that she can breastfeed in. I showed her how to style it in two completely different ways, simply by changing up her accessories. Simple! Both the colour & shape of the dress flatters Nesli’s body, whilst the accessories enhance her natural, bohemian style. Take this example of the humble blue jean & white top and see how different these 2 looks are, simply because of the accessories. We added hair & make-up and you can see a distinct difference. Accessories bring new life to tired clothes in an inexpensive way, particularly good for clients that fluctuate in weight as a handbag will always fit well! They’re also a great way of injecting some color in to your outfit if you are a little hesitant to wear big bold blocks of vivid shades. You can let accessories can make the fashion statement for you! An important part of my colour stylist service in Sydney is to evaluate the tone of clients hair. I frequently have female clients that highlight their hair, which over time, becomes too light and as a result their skin and facial features appear washed out. The lightness is caused not only through constant bleaching, but by the strong UV rays in Australia too. Therefore your hair stylist needs to correct this every few visits. 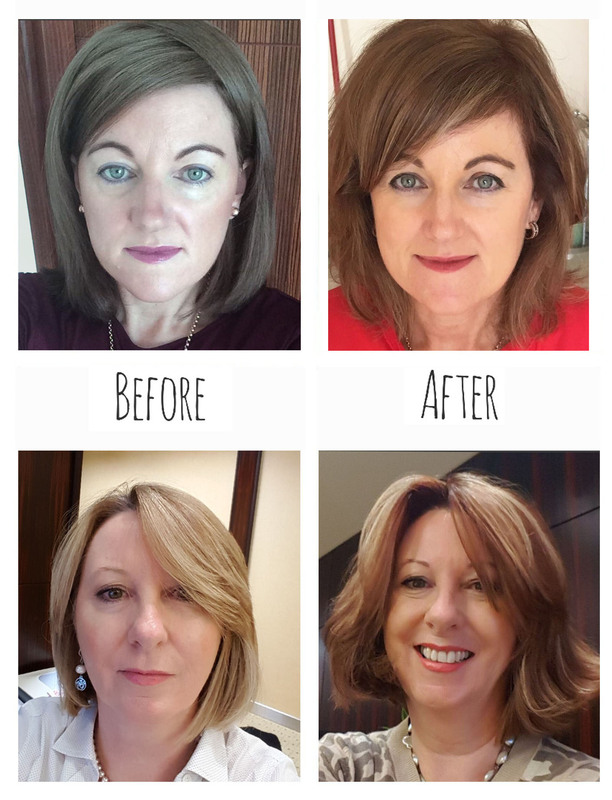 These clients benefit from adding some of their natural depth and richness back in to their hair to help re-balance their features. You can see how in both of these photos, the deeper hair shade makes their skin glow & eyes pop! This client needed a beauty makeover service to allow her natural strength in her features to shine. Dani also needed help to elove her style as she’d always wanted to wear a jumpsuit but didn’t know what style or colour to try, so therefore she’d never actually tried any on! The purple jumpsuit is too dusky and dulls her complexion, as well as altering her hair tone to a less desirable brassy level. However, wearing the orange corrects her hair tone and allows her beautiful blue eyes to pop! Whereas on some women bright orange would completely overpower them, Dani needs that strength and warmth to help her features come alive. She looks striking, yet balanced. Emily’s casual grey wardrobe did nothing to enhance her natural warmth and needed a colour consultant makeover. Stretch pants + loose shirt + flat shoes. Now Emily’s skin glows, looks younger because the outfit is more current and appears much more polished. This is a mum in control! 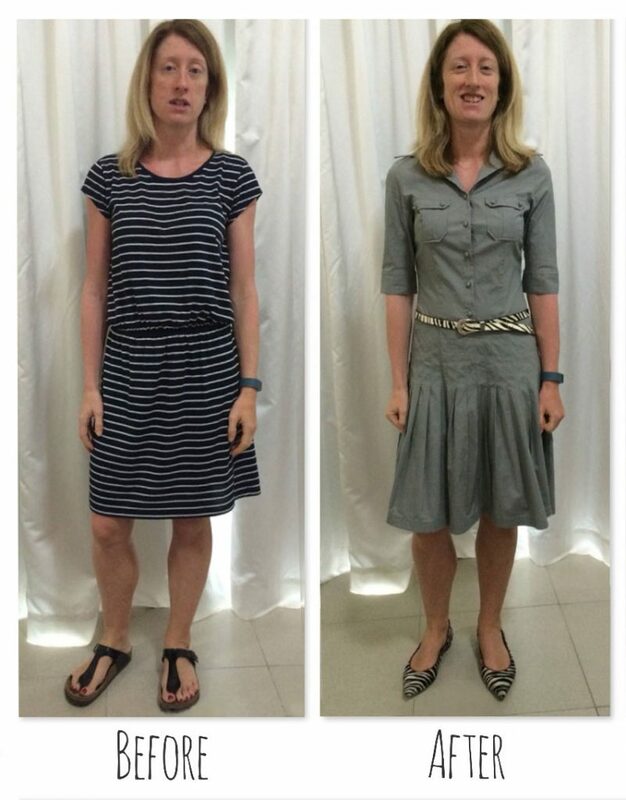 Despite Emily’s slim figure, this stripe dress doesn’t do anything for her so I gave her a style makeover. I chose another cotton dress from her wardrobe that flatters her body shape without being clingy. 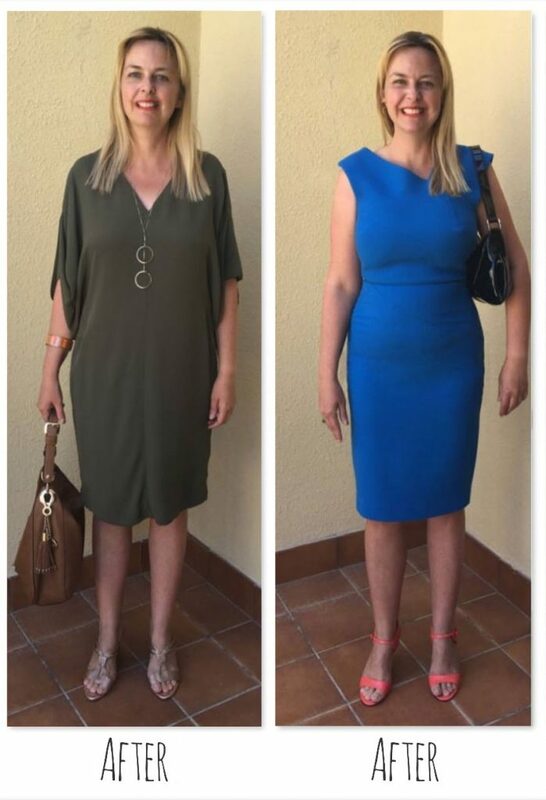 Usually Emily only wore this dress on the right with heels but I showed her how to style it differently to look effortless, remaining practical for her lifestyle. This dress gives her a waist and the full skirt balances her shoulders making her feel much more feminine, despite still being a casual cotton dress.